Professor Yoolip's most dangerous invention is probably the 8-Bit Game Cartridge-to-Reality generator, which is capable of reading any game cartridge from that '80s and turn the world contained within to reality. When he first tried this invention, it unleashed dragons, demons, and countless other monsters into the world... and a lot of heroes that wouldn't do anything unless told specifically where to go. Among these armored knights, boys in tights, and foreign princes, Yoolip found what appeared to be an 8-Bit version of himself... just sitting there, waiting for someone to take control of his destiny. 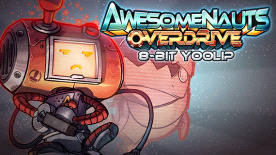 This DLC contains a custom skin for Professor M. Yoolip in Awesomenauts. The 8-Bit Yoolip skin comes with a unique character theme, killing spree theme, a unique voiceover, and special in-game audio effects for his abilities.